The very first set of paintings I had up at an exhibition in a real art gallery (as opposed to the community hall) contained a panel where a hummingbird and a dragon play a macabre tug-of-war. The panel was meant to be “Hell” in my triptych. In hindsight, a hummingbird in hell does not really make sense. A complete stranger made me listen to their interpretation of my triptych, which was totally inaccurate but they didn’t care about what I had intended to say, rather they were more interested in articulating their thoughts. They said that the hummingbird was in the work because of my desire for eating sweet things. I can’t deny my sweet-tooth, I have been known to devour entire cans of condensed milk by myself. Thinking about it now, 10 years later, maybe they were correct: The hummingbird is a symbol for a desire for sweetness. Over-indulging in sweet things makes one feel bad. It causes the teeth to rot. Rotting and feeling bad are experienced in hell. Hence the hummingbird in hell is not so out of place after all. But that’s not what a hummingbird means to me any more. 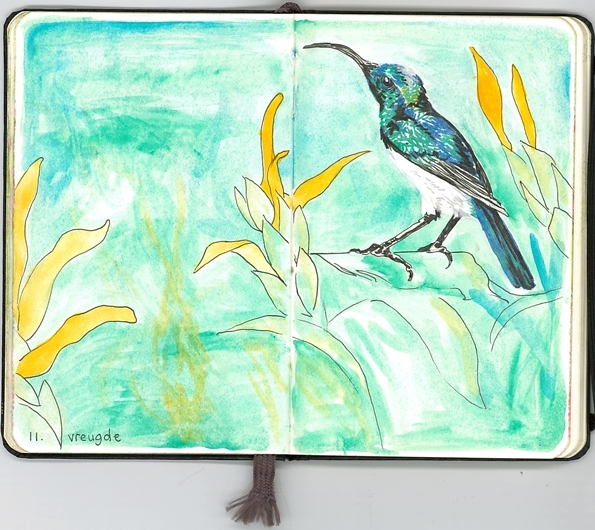 When we brought our newborn back from the hospital after a gruelling week in the ICU, I was greeted in the garden by a black-and-white sunbird. At the time, I thought it was a hummingbird. In Afrikaans we have only one word for both – suikerbekkie (lit. sweet-tooth). So in my symbol analysis, I am considering sunbird and hummingbird interchangeable. The differences between the two are size, and, more importantly, a hummingbird hovers while it drinks nectar, while a sunbird perches. A sunbird can also hover, and do mad flying tricks, it just eats in a more civilised manner by sitting down like a good girl. The hummingbird visited. I consulted my mother’s animal book, which stated that a visit from a hummingbird is an invitation to find JOY in one’s life. The bright colours, the cheerful song, the quick movements. Joy. But my hummingbird was black-and-white and this fact has plagued me. I have yet to resolve it. Yes, seeing this little bird brought much joy to my heart (it had been years since I had last seen a hummingbird in my garden) but black-and-white is not joy. Black-and-white is dichotomy. Opposites. Not gray. Polar. Boring. Demure. In photography the black-and-white brings our attention to the textures, to light, to the emotions. What is this hummingbird’s message to me, on this important day in my life – the day I bring my son home for the first time? Of course, it wasn’t really black-and-white. It just looked that way to my tired eyes, and she was in the shade at the time. She was a Witpenssuikerbekkie and the females of this species are brown and white. Not like the beautiful vibrant green in the male specimen I depict in my dictionary.